Brian was kind enough to allow me to share his answers to some questions in relation to the consulting company he ran successfully for 8 years. He brings a unique no-nonsense attitude to advising others about starting a computer business that I think helps cut to the heart of what this game is all about, passion and freedom. Can you describe your business, the services you offer, and how long you’ve been running it? Sarcnet industries provided consulting, network design, network installation, server and desktop installation, support, and maintenance for small businesses. We also provided managed hosting for clients with unique hosting needs. We were in business from 1999 – 2007. Providing assurance to my new wife that there would be a steady source of income to support our young family. We had a new house and a new baby. I had to convince my family that I wasn’t insane- including my parents, grandmother, etc. The biggest obstacles were mental. The single biggest factor was that I recognized a need for my services. Small businesses with under 20 employees often had 5-20 computers but no one to set up or maintain a proper network. They usually had a neighbor kid, or a cousin, or some part time person who came in when “he had time”. Small companies need a network administrator, even if they can’t afford the salary of one. Did you create a business plan before starting your business or afterwards? Why? No. I never really felt a need to commit it to paper, since the passion was so firmly in my head. What freedoms do you feel you have been afforded by working for yourself as opposed to working for another company? All freedom! Freedom from someone elses schedule, from someone else making rules that you may not agree with, from structure that you are philosophically opposed to, and countless other things. Working for yourself is complete freedom FROM working for another company. The only thing you give up is security, and even that isn’t guaranteed in today’s wild economy. Finding a family of mice inside of a customer’s PC. 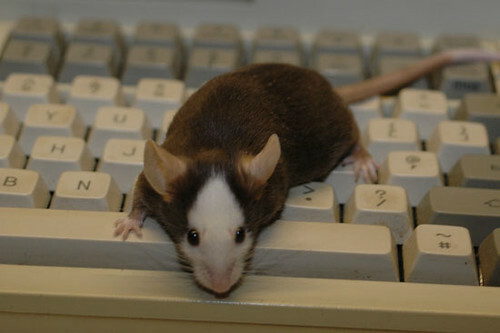 Actual live mice. Don’t do house calls. Focus on business clients. Mice?! Wow, that’s a new one. I guess we can add “pest control” to the list of skills required to be a successful computer guy! As you can see, Brian was able to recognize a need for his services and capitalized on that need with very little formal preparation. This is one example of how passion and determination coupled with skill and talent can merge to help one realize a dream career. Of course, I will need to find my own successful mix of these elements in order to grow my own business, but it’s encouraging to hear stories of others who have done well in this business. You can find Brian hanging out at Icrontic.com under the name Prime Suspect. I enjoyed your interview Matt. I’ll have to agree with your editor’s note. A perfect example of this is the difference between myself and one of my consulting friends. I have hundreds of small clients and he has a few large business clients. We make similar money and he has some advantages with these large clients. But he always says that if he were to lose just one of them, he’d take a major income hit. I could lose a client or two and never even notice a difference. So diversity and numbers can make a big difference when it comes to security. Thanks Eric. Yes, that’s a great example. I’m hoping to be able to mix the residential and small business clients to ensure a diverse customer base. Great interview and very informative. I read somewhere that mice cause most of the electircal problems in the world by gnawing on wires. Don’t know if it is true or not, but I once found a mouse living in the back of the portable refrigerator I keep in my classroom. Did he happen to mention ideas on HOW exactly a family of mice got inside a computer? Because, I’d be very interested in knowing how that could happen, haha. @ bosborne – That’s funny, but not surprising. Those little buggers love to chew! @ Dava – I can imagine that the user left their computer case open or the mice were able to squeeze through a gap in the back somewhere….goes to show ya it’s always a good idea to open up the case and clean it out from time to time!